Indie Retro News: Kelvin and the Infamous Machine‏ - Colourful adventure for Steam EA March 8th! Kelvin and the Infamous Machine‏ - Colourful adventure for Steam EA March 8th! Today is the day for adventure news as we've just had another heads up in our inbox, for a very colourful adventure game called ' Kelvin and the Infamous Machine ‏', developed by Blyts. 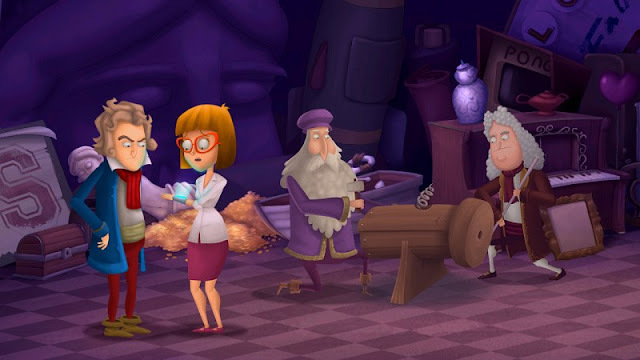 Unlike the other game we mentioned which is already out, this one is aiming for a Steam Early Access release on March the 8th, and according to Blyts, Kelvin and the Infamous Machine is a hilarious point-and-click adventure in which you stumble irresponsibly through history to help legendary geniuses complete their masterworks! Now it's rather unusual to get an early access for an adventure game, but the developer has said they are committed to making Infamous Machine a game that lives up to the legacy of the classic adventures that inspired them, something that could really take the game to the next level, such as full English voice acting. But if that wasn't enough as an early access tease, the game will have beautiful hand-drawn 2d environments with lovely deep colour tones, wacky puzzles, 56 quirky fully animated characters, over 1000 lines of written dialogue and an original soundtrack with 12 unique tracks. So if that sounds like your sort of adventure, as it does mine! Keep an eye on the steam page when Kelvin and the Infamous Machine‏ will be available through Steam Early Access 8th march 2016 for PC, MAC and Linux.